Switch to the collection that contains the file you want to delete. To do so, tap Collections, and then tap a collection, as shown below. Tap the Edit button in the upper right corner, as shown below. 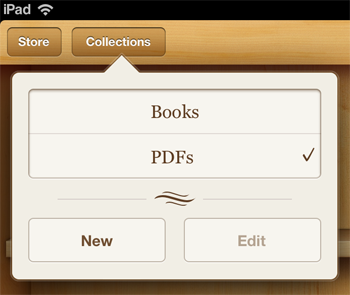 Tap on the books and PDF files you want to delete. The items marked for deletion have checkmarks displayed on their icons, as shown below. 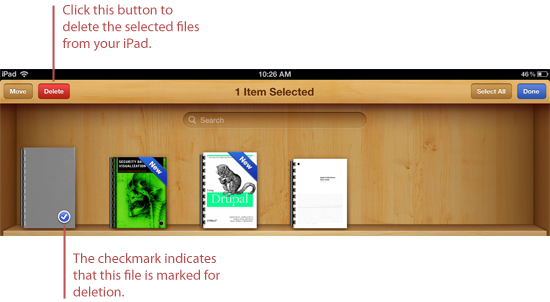 Tap Delete to permanently erase the selected books and PDF files from your iPad, iPhone, or iPod Touch. The alert shown below appears. Tap Delete. The books and PDF files you selected will be deleted. Tap the Done button in the upper right corner. That's it! The books and PDF files you selected have been deleted from your iPad, iPhone, or iPod Touch.